Hello NYC! Kick off WORLD PRIDE 2019 month with us at The Triad. 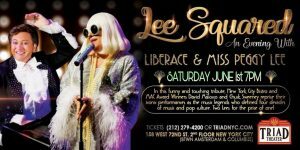 Liberace and Miss Peggy Lee….it really doesn’t get any gayer than these two icons on one stage. Swing on by and “Sing A Rainbow” with us on June 1st, 7PM! ONE NIGHT ONLY!